World War II was to have a profound effect on the entire world, Stoney Middleton a small village in the picturesque village of Derbyshire would not escape its impact, the village was bombed, it housed a military and prisoner of war camp, and tragically lost four brave young men who gave their lives and are remembered here. John was the son of Francis & Ellen Nugent of Stoney Middleton born 9th Aug 1914. After qualifying at St Mary’s Training College, Strawberry Hill, near London (now St Mary’s University College). His specialist subjects were maths and music which he taught in London, moving to Brighton when his school was evacuated. He joined the RAF’s 49th Squadron in 1940 as a navigator, flying Lancaster bombers. The squadron flew 21 missions on targets, in Germany principally on cities including Hamburg and Berlin. The squadron took part in the Dambusters raids on the Ruhr Dams in Germany. They were part of ‘formation No. 3; a mobile reserve consisting of 5 Lancaster aircraft, taking off two hours after the lead aircraft. They took off from RAF Scampton at 0015 on 16th May 1943 to bomb either the main dams at Ruhr or a smaller secondary target the Diemel Dam, in the event they were redirected to the Sorpe dam, but unfortunately were unable to reach the target due to mist in the valleys, and they returned to base with the mine (bomb). On the 23rd September 1943 the squadron set off for Mannheim in northern Germany on their 21st mission to bomb the northern part of Mannheim, a campaign which involved 628 aircraft and cost Bomber Command 18 Lancasters, 7 Halifaxes and 7 Wellingtons. 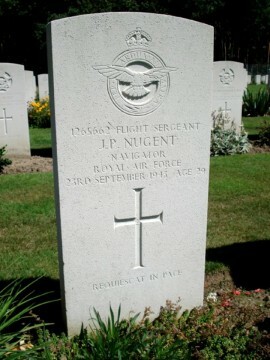 The following is a account from 49 squadron.co.uk of what happened next. Once over the target, fighters were again much in evidence. The use of searchlights in co-ordination with fighters accounted for many of the losses and very sadly, the luck of two other 49 Squadron crews did not hold out. 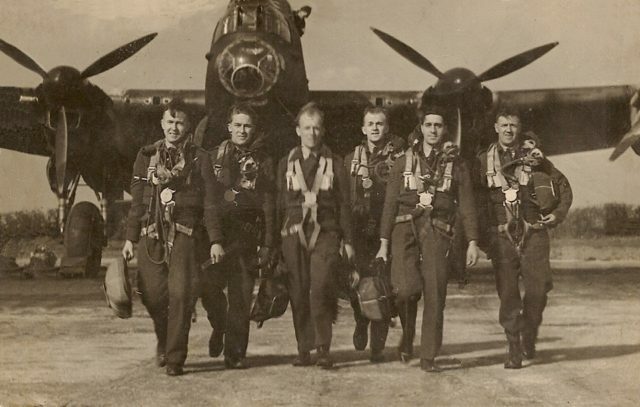 Cyril Anderson and his Dambuster crew flying in the Wingco’s aircraft, D-Donald, failed to return and were all later reported killed… this would have been their 21st operation. John was 29 at the time of his death, there is a memorial at Rheinberg War Cemetery Germany. Leslie was the son of Reverend George Caldwell, the vicar of Stoney Middleton church. On the night of Tuesday the 10th March 1941 squadron 158 flying a Wellington II took off from its base at RAF Driffield, Yorkshire at 19.34hrs, tasked with an operation to Essen a city in the central part of the Ruhr area in North Rhine-Westphalia, Germany. After dropping their bombs they made for home. On their return to Driffield at 02.50hrs the aircraft crashed and caught fire, sadly five of the crew were either killed in the crash or were unable to escape the burning aircraft. Leslie was 22 at the time of his death, he is buried at Tansley Churchyard, Derbyshire, the parish where his father had latterly moved to. Tom was the son of Tom and Edith Annie Pinder; husband of Ena Pinder of Stoney Middleton. Died of his wounds 13th March 1941. Age 32. Stanley Waine (4977051 private) Sherwood foresters 5th Bn. Stanley died on August 18, 1943 and is buried in Massicault War Cemetery south-west of Tunisia.